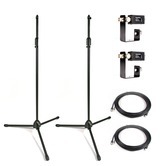 Connevans stock and supply a wide range of spares and accessories for Trantec radio microphones. Trantec S4.04, S4.4, S4.10 and S4.16 Trantec systems have a locking 3.5mm screw fit connector. The lapel microphone usually supplied with these systems is the LP2. Trantec Series 5 systems have a 4 pin mini XLR connector. Legacy Trantec systems use lemo connectors as their radio microphone connector - i.e. S1000, S3.2, S3.5, S3500, S4.5, S4000 etc. - as a helpful guide any microphone with a lemo connector will fit any Trantec transmitter with a lemo socket. Please email sales@connevans.com if you cannot locate the Trantec product that you are looking for. Earworn microphones for Trantec S4.04, S4.4, S4.10, S4.16, S5.3 & S5.5 radio microphone transmitters. Headmics for Trantec S4.04, S4.4, S4.10, S4.16, S5.3 & S5.5 radio microphone transmitters. Lapel microphones for Trantec S4.04, S4.4, S4.10, S4.16, S5.3 & S5.5 radio microphone transmitters. Power supplies for Trantec radio microphone receivers. Receivers for Trantec S5.5, S4.10 & S4.04 radio microphone transmitters.